I’ve had this recipe sitting in my blog’s draft section for almost two months… I guess I’ve been too excited to post some other recipes first, but this kind of recipe is tried and true, a lovely, tasty side dish for any meal, and really easy to put together. Plus, although these root vegetables are described as fall-winter vegetables (when they are in peak season), they are veggies that are conveniently available year-round at general grocery stores. Carrots: Sweet and earthy. Other than it’s most common colour, orange, carrots can range from red to yellow, pink, white, or purple… so pretty. Parsnips: These cream-coloured vegetables are more starchy (potato-like) in texture than carrots. Their flavour profile is similar to carrots as it's sweet and earthy, but also has nutty tones. Sweet Potatoes: This starchy vegetable is naturally sweet (hence the name). To note, sweet potatoes are also sometimes called yams (although they are not the same). I used the type with copper skin and orange flesh. Prior to roasting, I tossed the vegetables with olive oil and balsamic vinegar, which gives it a rich acidic-sweet flavour that’s just so pleasing to the palate. In all, these are good-for-you vegetables that are full of vitamins and nutrients. In particular, carrots and sweet potatoes are an excellent source of vitamin A and beta-carotene, which assists in immune function and maintaining healthy skin, eyes, and vision. Parsnips are a rich source of potassium (so are sweet potatoes) that aid in heart health as well as a good source of dietary fiber, which is good for proper digestion. It’s herbaceous, aromatic, nutty, lemony, and garlicky! A wonderful compliment to the roasted vegetables and it takes minutes to make from scratch. I used a bunch of fresh basil from my husband’s basil plant that looks more like a mini tree and just keeps on growing and growing. It's a good thing he's the one tending to our herbs because I would have accidentally killed them by now. This pains me considering my parents are avid vegetable gardeners, but I have not developed a green thumb to match, yet… gotta stay optimistic. For something a little different, but so delicious, check out my other pesto recipe: 5 Minute Kale Walnut Pesto, which is vegetarian (it has cheese in it) and gluten-free. Slice the vegetables to a similar size and thickness. That way they will roast/cook at the same time. Placing the aluminum foil on top for 20 minutes helps keep the moisture in. Roasting for the last 10 to 15 minutes allows the vegetables to get that tasty caramelized, char on top. So good! To make the pesto, you can pulse the ingredients together for a chunkier texture or puree the ingredients in the blender for a creamier texture. The creamier texture would be great as a dip if you prefer to snack on the vegetables that way. 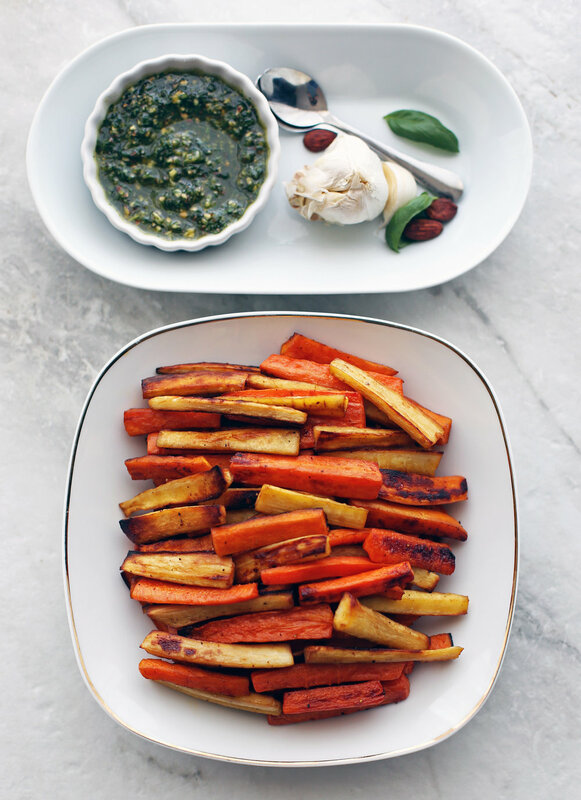 Can also be used as a healthy snack: Use the pesto (blended for smoother texture) or another sauce as a dip. I hope you try this recipe out! If you do, please leave me a rating and comment below or tag me (with a picture if possible) on any of my social media. For the roasted vegetables. 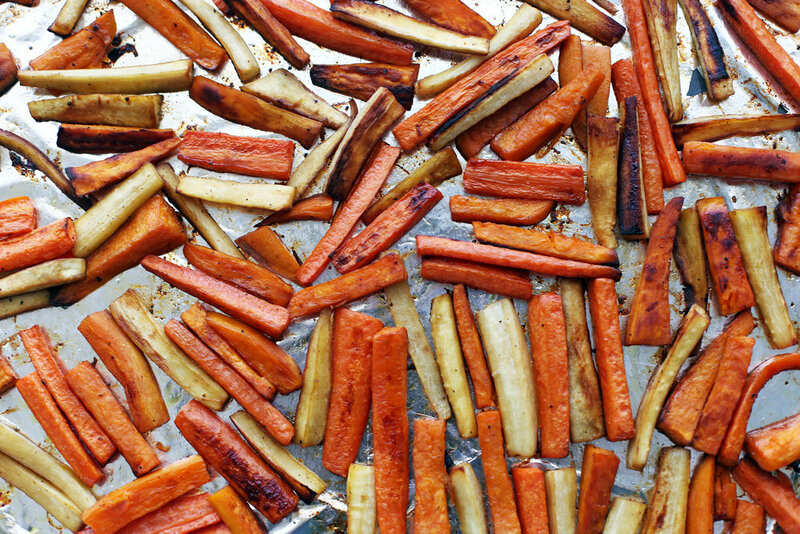 Preheat the oven to 425 degrees F. In a large bowl, toss together the carrots, parsnips, and sweet potatoes with the olive oil, balsamic vinegar, salt, and pepper until well-coated. Place the vegetables on a baking sheet (lined with aluminum foil for easy clean-up) in a single layer and then cover the top of the baking sheet with aluminum foil. Roast for 20 minutes before removing the foil. Give the vegetables a stir and flip, then bake for another 10-15 minutes, until lightly browned and tender. For the pesto. As the vegetables roast, add the basil, almonds, garlic, lemon juice, salt, pepper, and 2 tablespoons of olive oil into a food processor (or blender ***see third note). Pulse several times, until a paste forms. With the food processor running, slowly add in olive oil until you get your desired consistency. Taste and adjust ingredient amounts according to your preferences. Put it together. Plate and drizzle the vegetables with your desired amount of pesto. Best served immediately. For the carrots, parsnips, and sweet potato, peel and cut the vegetables lengthwise then halve or quarter into an uniform shape. Sweet potatoes are also sometimes called yams (although they are not the same). I used the type with copper skin and orange flesh. Using a blender to make the pesto will result in a smoother texture, whereas using a food processor will result in a chunkier texture. Nutritional calories represent one serving with six servings total.